Please find attached a strange error I received when publishing with Presenter 13 (CD publishing). Have an idea of this type of error? Hi Jack! Hopefully you'll get some community feedback that you are looking for here. As you can see, I do not have an update to provide at this point. I found a way to publish my project that may help others experiencing similar issues!! I noticed that when the error occurred, a new slide appeared at the end of my PowerPoint file, which had an image I recognized. It was a smart art I had used in one of the slides of my project. I decided to preview that specific slide (Menu/Articulate/Preview) and I saw that the same error occurred. After that, I tried transforming that smart art element for a regular image (png), then I tried previewing the slide (Menu/Articulate/Preview), and "voila" the error stopped occurring. In other projects where I was experiencing the same error, I started checking slides were I had used smart art figures or similar. I found that the errors were related to smart art elements or charts although not all of these type of figures were related to errors in the publishing process. Thanks for that update Ricardo. In relation to that, we have a document about supported Powerpoint animations in Presenter '13. Hopefully this will be useful to anyone who may come across this thread in the future as well. Ricardo, you rock! I've been trying to no avail to figure out this problem for FIVE days now!!! Thank you soooo much! Wish I had found this site sooner! HI there Trudy and welcome to E-Learning Heroes! Have a great day and welcome again! I am also having problems with this, but unless I missed something the "fixes" are not helping. 2) If I remove the custom player and go with the original/basic/default player, it publishes. 3) If I make even one small change to the default player or use any custom player at all, it will not publish. I'd like to take a look at what you are working with if possible to see if I am able to re-create your issue. I will send you a PM so that you can upload properly for review. Muriel Wahl; you´r writing about that the error message disapears when you take the "searsh"-option out. Where do you do that? I hope that can help me to! Hi Erika and welcome to E-Learning Heroes! You can read more about it in this tutorial. Hi Leslie and thank you! I hoped this could solve my problems with publishing but unfortunately it didn´t. I have the same problem like the rest in this conversation. I´m trying to publish in our LMS but get the same errormessage I´v seen here. I´m in contact with a swedish support so I hope they can help me out. I'm going to send you a PM so that you can upload your files for review. I just now encountered the same problem with only one course file but not with others, as they're publishing fine. This file published fine until today after I upgraded using Update 2. I tried rebooting, using a copy of the file, reinstalling the upgrade, etc., and I kept getting the same error the OP posted but when publishing to an LMS. 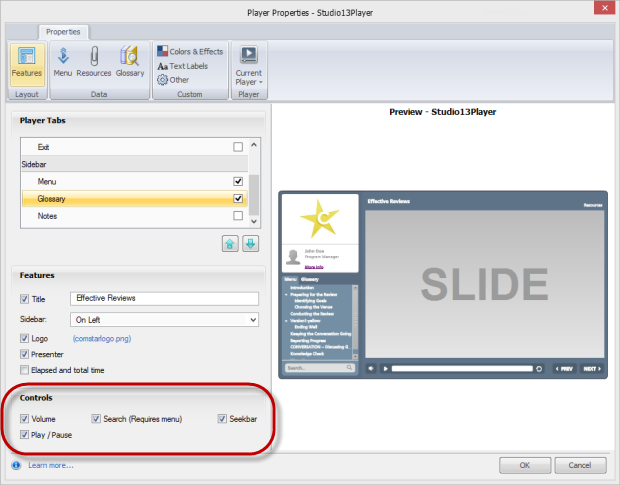 The error popped for this course file when the slider showed that the slides are being generated, specifically Slide 10. So I tried to preview Slide 10, and the got the error. Same problem with Slides 11 and 12. Other slides before 10 and after 12 previewed fine. Through trial and error, I deleted an item from Slide 10 and then previewed the slide. Turns out the error was popping when a text box with text (naturally) and a colored background was on the slide. Really didn't understand why that would suddenly cause an error. We have a bunch of these text boxes on slides throughout the course and they preview fine. So I copied a text box from one of the slides wasn't generating an error, pasted it on Slide 10, replaced the text and changed the color of the background to what it should be for that slide, and everything magically worked. Did the same thing to Slides 11 and 12, and then was able to publish the file without incident. Interesting Tim, please let us know if you run into something like that again, but I'm glad that you were able to get it published as needed. Ricardo's suggestion worked and is MUCH appreciated. I was publishing to our LMS via Presenter 13, was getting the same error message, but the solution still worked. You just have to keep a close eye on the publishing progress, then change the slide that is causing the error. Other than that - a very simple fix . "When publishing, all goes well until slide 4, which has an embedded video file. Publishing fails at that point and error dialog box appears. This presentation worked fine in Presenter '09. I have 6 projects just like this one with a short deadline to convert and load to new LMS." Case # 00390514 - also sent error file and presentation file. I have experienced this problem repeatedly since upgrading to Presenter '13 and reported it countless times to the company. With so many reports/complaints from such an active and involved community of users, I would have expected this significant problem to have been resolved by now. Am disappointed in Articulate's overall response to this major issue. Hi Emily! I see where you just uploaded your case today and I'm sure that support will take very good care of you. We were unable to replicate Keith's issue and resolution was reached by deleting his ppta files and recreating them. When resolution is unique to the individual and unable to be reproduced by support, it is not always shared so that confusion is minimized. We have responded to all of the issues shared with us and all reached resolution. I do not see where you have reported this before without resolution, do you have another profile so that I can search? Hi all, my first post, please forgive me if my post is not up to the standard of this forum. I have a similar problem to the one described by the original poster, and by Tim. I have Presenter13 update 2, no search enabled, no specific Template, no pop up text box, nothing special. I have 3 présentations and the same error occurs for 2 of them, not the other one. Basically it stops at the last slide, and then the same error as mentioned before appears. I noticed that the last slide displays in french, but the Note tab displays some text in English, this could be because I translated the original slides (from Studio'09) from English to french. So I tried removing that slide and recreating it (copied from another slide, removed the audio and tried to publish it again) but it does not remove the error. I tried to contact the french support, but they declined to help much as I purchased Studio13 directly from USA. I have wasted over 20 hours on this (it takes about 30-45 minutes to publish before the error comes up). So now I'm really stuck and getting very unhappy about this upgrade 2. Please either fix this quickly, or go back to the previous version. Hi Bernard and welcome to E-Learning Heroes! Thank you for sharing your support case number and I can see where you are actively working with Wilbert. I will follow along with the case as well. I looked at your previous post to Emily, and thought that recreating the PPTA file might be a solution. it failed AGAIN. i.e. there was a long wating period after slide 260, but I did not notice the error message screen. (did it disappear or not appear at all). I only had again the Publish windows displayed. I looked at the transfer of data between the PC and Articulate, but no data was sent. I checked on Articulate Online, and the old content was still there (saved on 09JAN14), not the new one. So another 2 hours wasted., it's now 23H05, I'll go back home and try to relax. I hope that you and your team will quickly find an answer. This is crabby Emily back with an update to my, apparently unique to my machine, problem. To give Bernard some hope . . . it DID eventually get resolved, but took a couple of days working with Wilbert in Articulate support (they must give him the tough cases). It seemed like a trial and error process. First I was instructed to try to "repair" Presenter '13, which didn't fix the problem. Next I was given a a URL to another weblink (http://www.articulate.com/support/presenter-13/unexpected-or-erratic-behavior-in-articulate-studio-13) with a long list of instrstructions, which required uninstalling and reinstalling both Presenter '13 AND MS Office, rebooting a couple of times, and a few other steps. I had to get my IT dept. involved at that point. I want to give Wilbert a lot of credit for his patience and persistence in sticking with it. However, there is still no explanation why the content worked fine on my machine in '09 and wouldn't work when converted to '13. He said he could run my content fine on his machine, which is why I had to go through all the extra steps. Hope everyone else who is experienciing similar problems can find some solace from this. Soldier on! Thanks Emily for the update! Not crabby at all! I appreciate your thorough update to the community and it looks as if Bernard's project is in testing right now, so hopefully he will be to resolution soon as well. 1/ tried splitting the course in two parts, just in case it was a size issue. It worked for the small (67 slides) section, with publishing to CD. 2/ it did not work with the second (larger 187 slides) section, which - when trying to publish locally - led to the same error. IIb (incorrectly published to CD), contains: presentation_content folder (containing only a notes folder [not the other folders] and a lot of other files), a meta.xml file and a Temp folder (containing only the four resources files, and four png files describing the resources as PDF files). By profession I'm a software tester, and it is my opinion that (unfortunately) Studio13 has been insufficiently tested. Specifically regression tested. I understand that there are economic and marketing issues that would lead to releasing software quickly, but it's really bothersome [from the user's perspective]. I see where you are continuing to work with support on your issue Bernard, and I appreciate that. Well Leslie, I'm trying to provide them with data so they are able to fix my (and other's) problem. Unfortunately, no answer from Wilbert yet, though I uploaded him a new package 20+ hours ago with a clear pointer to the sslide posing problems. I hope he will get back to me quickly. "Hi Rochelle and welcome to E-Learning Heroes! Glad that you were ab..."
"hi, just to add information for support on the case. I've noticed t..."
"Thanks for that update Ricardo. In relation to that, we have a docu..."